The design incorporates a large number of holes penetrating the panels, linking the top and bottom surfaces. These holes are orientated in such a way as to create a grid pattern on the surface which delivers a substantial structural load bearing ability as well as allowing the vehicle tyre to engage the panel's surface. The holes allow rainfall to soak through them over the majority of the surface. As rainfall exceeds absorption and begins to flow on the surface, the holes in the panels function as multiple silt and water traps, limiting erosion. The holes also trap the sand or soil material together creating significant structural strength as well as encouraging plant root growth in and around the panel, further stabilising the system. The panel surface has grip lugs incorporated for better traction and to trap and retain some level of soil material on the track surface. This significant feature allows for the panels to be camouflaged by the natural ground material. 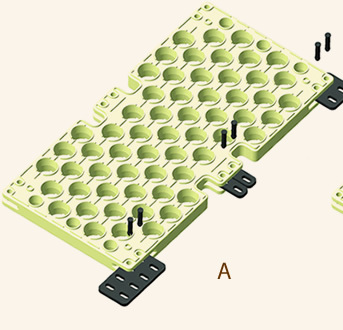 The slots in the linking plates allow for the creation of curve radiuses. Up to 15 degrees change in angle is possible in the horizontal plain at each panel's connection point. These two features allow for a high degree of flexibility in road alignment. Two different specifications are on offer, extreme heavy duty applications and standard applications. Consult Gough Plastics for recommendation on the appropriate specification level for the application. The panels are manufactured from a blend of virgin and recycled, tough UV-stabilised, non-corroding polyethylene by the roto-moulding process. 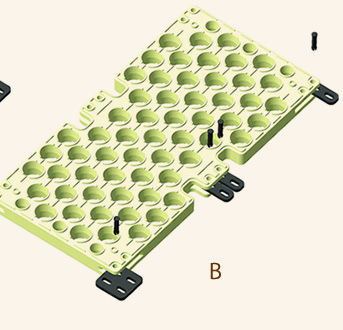 Panels, connector plates and locking pins are all plastic insuring a corrosion-free system. The panels are hollow-moulded structured modules, produced using the roto-moulding process.